It finally hit me. A man I didn’t know, who had an influence on my life that I wasn’t fully aware of, died. Sometimes the process of understanding or self-realization takes a little while. 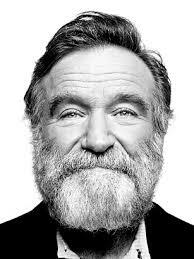 Today I watched a tribute to the many voices of Robin Williams. I watched with my young daughters; ages ten and eight years old respectively. They knew him as Genie, I knew him as Mr. Keating, Peter, Jack, Mrs. Doubtfire, Patch, Mork, Lovelace, Teddy Roosevelt and Sean. It was in those brief moments that a thought unveiled itself and terrified me to the point of tears. It seems that more often than not, we are caught completely off guard by suicide. Even in cases in which we knew very little or had no contact at all with the individual. “We just don’t know what the people in our lives are going through,” I further explained to my young innocent child. We can’t know what every person is walking through. Especially when we don’t even know what’s underneath our own understanding of who we are. And there it is. The almost paralyzing realization that there are issues lurking underneath my “calm, collected” facade that even I am unaware exist. As I continue to walk down the path God has for me, I will encounter challenges and circumstances that I have never faced. In those moments of stress, strain and difficulty, there is a potential to unearth issues, emotions or scars that have been dormant my entire life. Planting a church, raising children, marriage and friendships all have the potential to dig up these unknown areas of my heart and life. I can’t say I’ve ever struggled with depression. I’ve had a couple anxiety attacks over the years and even had two seasons of what some might call feeling depressed. I’m not ashamed or embarrassed to confess having depression. My experiences just don’t seem to line up with what I’ve read on the subject. But I do now recognize that I don’t fully know what’s underneath. You don’t either. Neither does your spouse or your children. Your student, teacher, coach, pastor, neighbor or friend. We can’t know. In light of this knowledge of the unknowable, we should take great care to extend the grace and mercy that our Creator has extended to us. He does know. It moved Him to action. He saw our sin; our layer cake of dysfunction and sent His Son to intervene. He knows what’s truly underneath and He loves us all the more.